If you are looking for a fluid workflow between Panasonic Lumix GH5s 4K H.265/HEVC footage and FCP X, you may wish to read this post. It explains how to get FCP X recognizing Lumix GH5s 4K H.265 files without glitches. “Hi there, I have problems with some 4K files from my Panasonic Lumix GH5s camera in FCP X the current version. When I browse the media and click on the file, some music files or video clips load but with the sounds as if it was missing pieces,skipping and it’s not in sync with the image. First thing that comes to mind is that you’ve shot using H.265 (HEVC) and your system is having difficulty with the media. If that first part is true, try using a video converter to transcode Lumix GH5s 4K H.265 files before editing. Learn how to convert Lumix GH5s 4K H.265 for editing with FCP X. How to convert Lumix GH5s 4K H.265 for FCP X? Step 1: Click “Add File” to load video files that you want to convert into this MP4 to FCP X Converter. Click “Profile” to select output format. 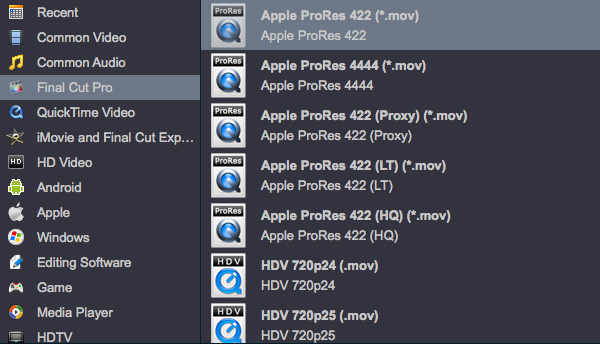 If you are using FCP X on a Mac machine, simply choose “Final Cut Pro” > “Apple ProRes 422 (*.mov)” as output format. If necessary, you can click “Settings” button to modify video and audio parameters like encoder, resolution, frame rate, bitrate, aspect ratio, sample rate, and audio channels. You can also “enable 3D Settings” to add 3D effect to your source media. Click “Convert” button to start H.265 to ProRes conversion. As soon as the conversion is complete, click “Open” to get the generated files for editing in FCP X with optimum performance.